The EA-6B “Prowler” was arguably the single most important Electronic Warfare aircraft ever produced. This historic retirement flight holds the distinction of being the next-to-last “Prowler” flight in history. 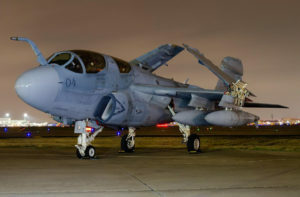 The Frontiers of Flight Museum will mark the arrival of its latest aircraft, the Northrop Grumman EA-6B “Prowler” BuNo 162228, with a community celebration on Saturday, April 13 from 10 a.m. to noon. This family-fun event features veteran speakers, photo ops, Q&A with former “Prowler” pilots and crew, refreshments, and activities for kids. Guests are invited to come “prowl” around the museum and welcome the “Prowler” to her new home! For more information, visit: flightmuseum.com/ea-6b-prowler-party/. The museum is at the southeast side of Dallas Love Field Airport, north of Mockingbird Lane.